NDVI is an index (a unit-free number) related to how much photosynthetic activity is occurring. A single NDVI value can be determined for an individual leaf or a 200 acre corn field. 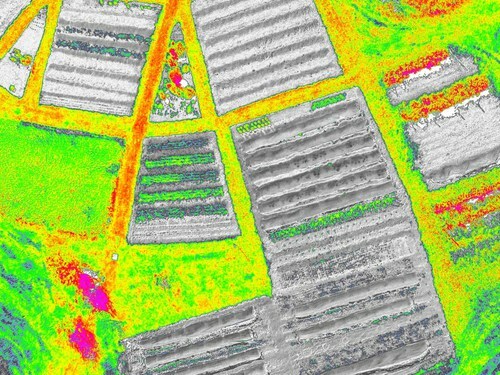 Or an NDVI value can be determined for every pixel in a photograph of a leaf or of a corn field. If you have a value for every pixel, you can assign different colors to different ranges of NDVI values and make a false color map of how NDVI varies spatially. You can use any color scheme you want, and I have been using one that turns images into "heat maps" of photosynthetic activity by painting high NDVI values with hotter colors. A long time ago, someone suggested that this type of color map was not helpful to people with red/green color blindness like protanopia. .
My standard color map for NDVI images (top), and how it looks to a person with protanopia (bottom). NDVI values below zero are assigned a blue color. 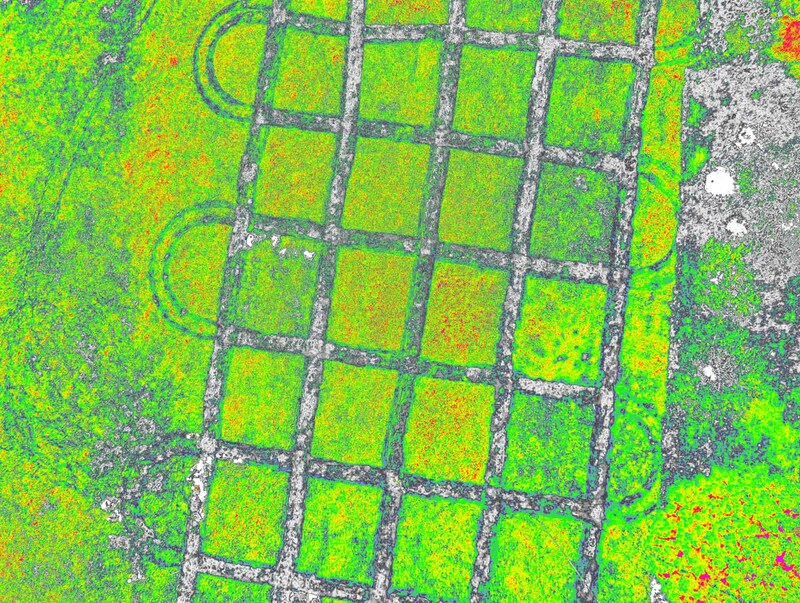 NDVI values above zero are assigned colors on a gradient from green through yellow to red, so greater photosynthesis is highlighted with hotter colors. Protanopes see this gradient very differently. There are lots of web sites which show you what a color photo looks like to a color blind person. 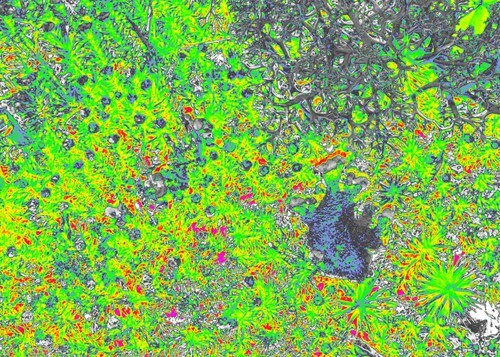 Different sites produce slightly different results, but it is obvious that the eight percent of white men with color blindness (< 1% of white women have it) can't derive much useful information from NDVI images colored with this colormap. The problem is that red and green don't look very different to color blind people. So I made some colormaps which had only red or green but not both. A colormap (upper) and how it appears to protanopes (lower). 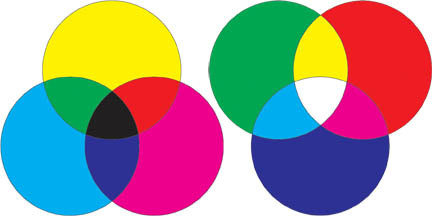 I was unable to find a color gradient that allowed color blind people to derive as much information as the rest of us. Without both red and green, it is very hard to find a gradient that would allow similar values of NDVI to be distinguished. There just aren't enough other colors. Maybe there is a trick I am missing, but I gave up. Sorry bros. NDVI images can use a grayscale gradient or other simple gradient that everybody can discern, but then nobody could get the full impact of the images. For now, I am going to continue using both red and green, and my new colormap is below. 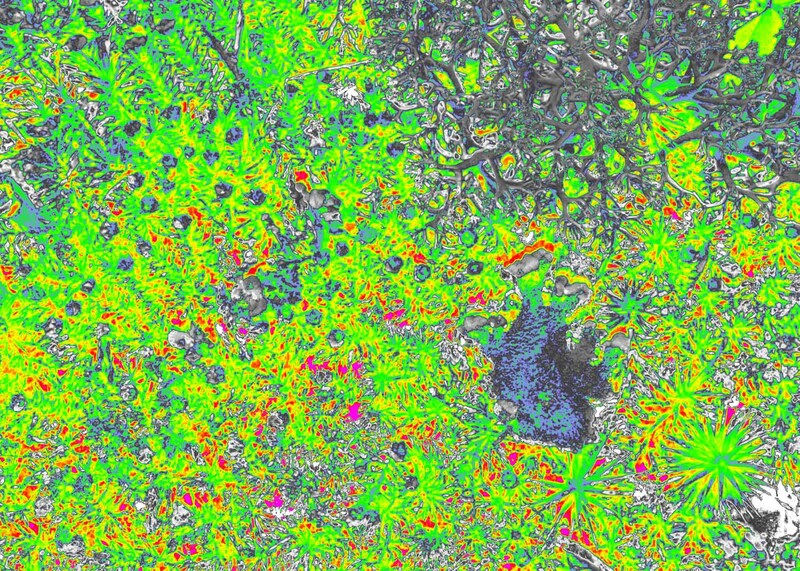 The new colormap I have been using for NDVI images (above) and how it appears to protanopes (lower). It's not very useful to protanopes. This new colormap has several useful features (for about 90% of us). 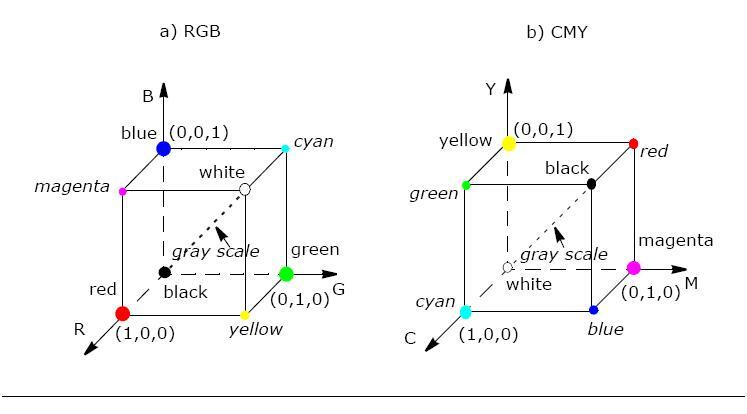 The left half of the colormap has three gradients between black and white. This does not allow you to discern the value from the tone, but the values of NDVI below zero indicate zero photosynthesis, so we generally do not care exactly what the value is. 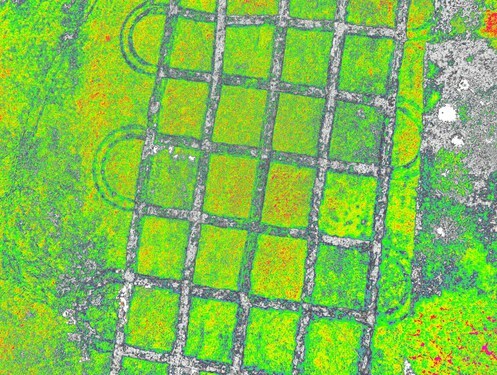 The multiple gradients preserve the detail of non-plants in the NDVI image. 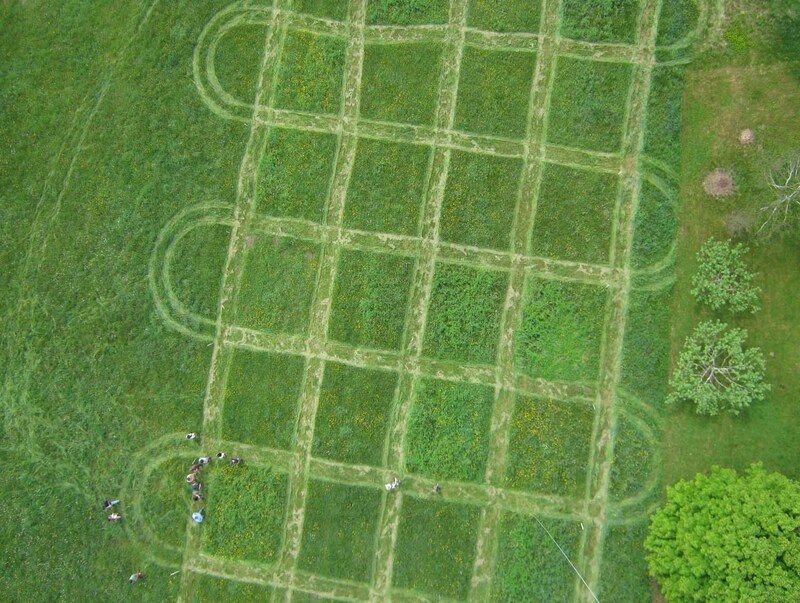 It just makes the NDVI image easier to look at because you can recognize objects and textures that are not foliage. The boundary between grayscale and color is not at zero. Live foliage generally does not have NDVI values below 0.1, so that is the boundary between grayscale and color. With this colormap, anything in grayscale is probably not a plant. This allows a more precise differentiation between plant and non-plant when the NDVI values are calibrated. There is a narrow band of violet between 0.1 and 0.2 which could represent very low photosynthetic activity, but might also be noise or error. The primary gradient of photosynthetic activity is from NDVI values from 0.2 to 0.9, and that is represented with a classic heat map from green to yellow to red. It's a little bit counter intuitive because green does not represent the healthiest plants, but the heat map metaphor seems to work well for most people. The highest values (> 0.9) are colored magenta. 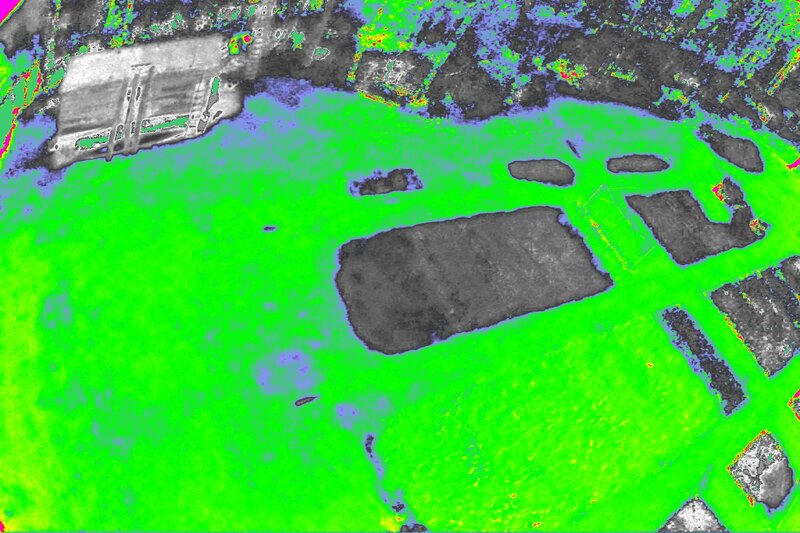 Foliage generally does not have NDVI values this high, so this color represents non-plants. I did not make it a gray so it can be distinguished from low values. 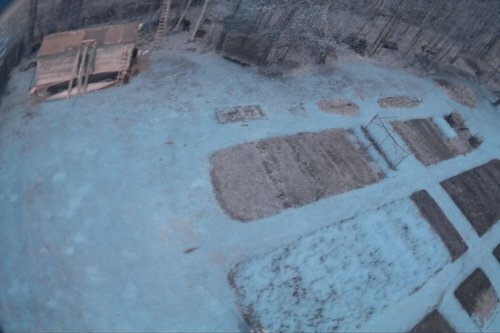 In many cases, DIY NDVI values above 0.9 are artifacts where the image is very dark or very bright. .
A legend for the new colormap. 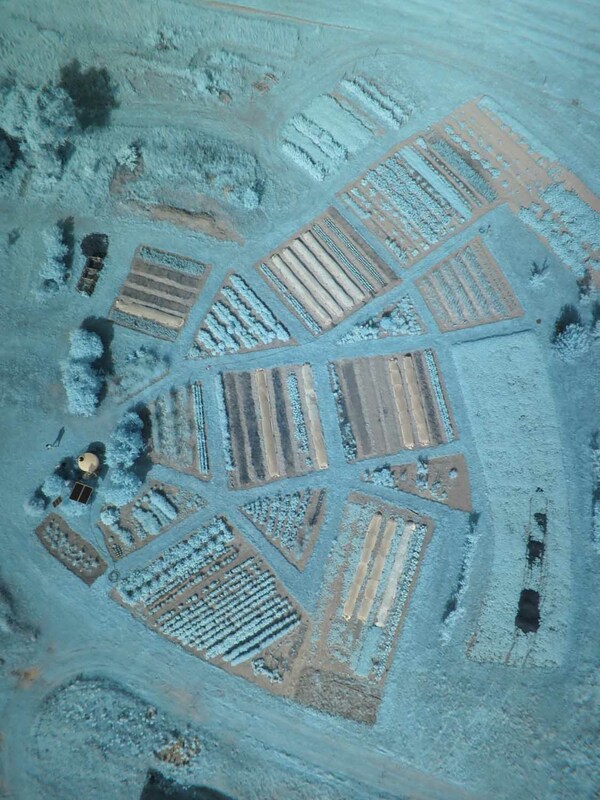 Below are some NDVI images colored with the new colormap. I have included the original photo, either normal color or Wratten 25A super-red Infragram. 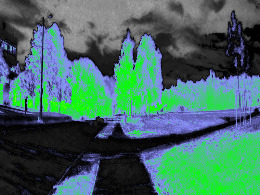 If a normal color photo is included, the NDVI image was derived from a two-camera system. In some cases a constant was added to the NDVI values of all the pixels to shift them to a more meaningful range. In other words, these NDVI images are not calibrated except by brute force. The NDVI images were made with the Photo-monitoring plugin for Fiji. 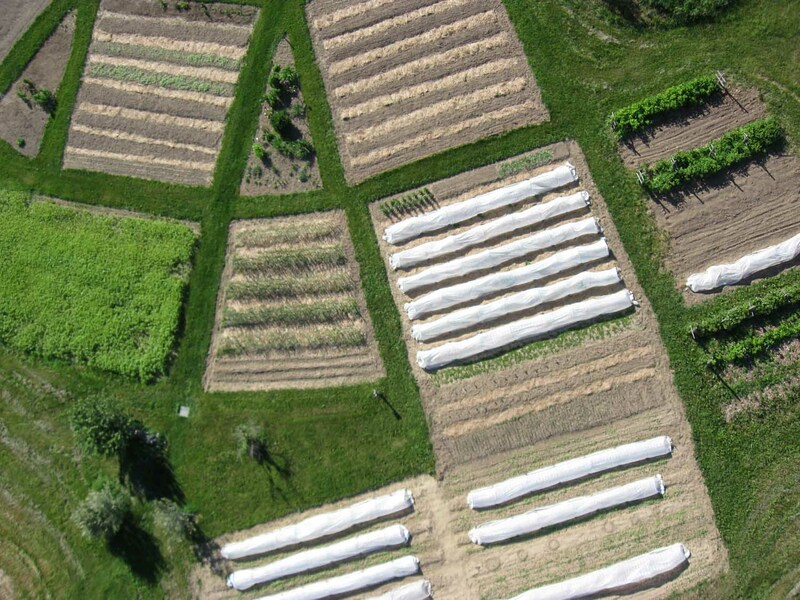 Middlebury College Organic Farm . Middlebury College Organic Farm taken by Teddy with an S100 . I will make this new color map available as a lut file for use in Fiji when I figure out how to add binary files to research notes or wikis. This should be copied to the C:\Program Files (x86)\Fiji\Fiji.app\luts directory or something like that on Windows, and I guess to .../Applications/Fiji.app/luts on Mac. I will have to ask Ned to include this in the package at Github. In photography: The subtractive colour spectrum (start by calibrating White-balance) gives red, green, blue. 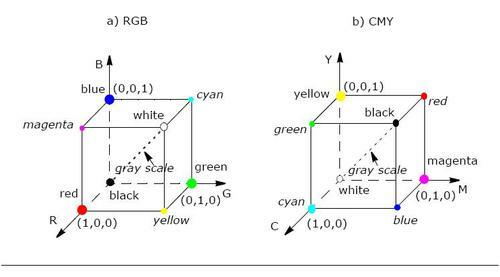 The additive colour spectrum (start by calibrating Black-balance) gives cyan, yellow, magenta. Greetings, Just post the CSV file for the gradient. It is easy enough to create the LUT file. Will Fiji make a lut file from this? Actually, Fiji needs as CSV file to work on. So, I copied and pasted your text file into EXCEL and deleted the top line. Each column in your text file needs to be in a separate column in the excel file. So, saved as a csv file and then used the LUT IMPORT plugin to bring the csv file up then used IMAGE>COLOR>EDIT LUT to save the LUT file. You can also invert the gradient and save the invert too - which I did. I have tried attaching the files but for some reason they don't want to upload. If you have trouble creating your own LUT files, send me your e-mail to mine as aswicks@gmail.com I will send them to you. It looks like there may be some image processing being done on the website. Are you using histogram stretching, or a modified NDVI calculation? Currently, I am just using NDVI = (B-R) / (B+R). Wow, I didn't know there was a Fastie colormap at Infragram.org. I think it will need a new name (How about VGYR for violet green yellow red?). I guess Jeff ported it to Infragram. The translation must have been done by hand so there were probably translation mismatches. But there might also be processing differences. Your output from MATLAB looks excellent. Nice legend. The Fastie colormap was already implemented in infragram.org, so I can't take any credit there! What I am wondering is why there seems to be a shift in the NDVI between the MATLAB and infragram.org outputs. 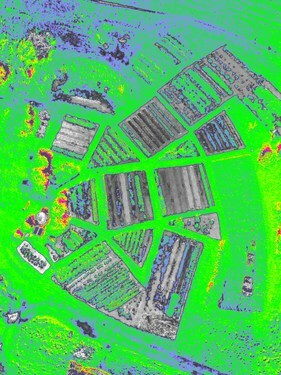 It looks as if the NDVI at infragram.org is a bit higher than the values which I calculated using your colormap. 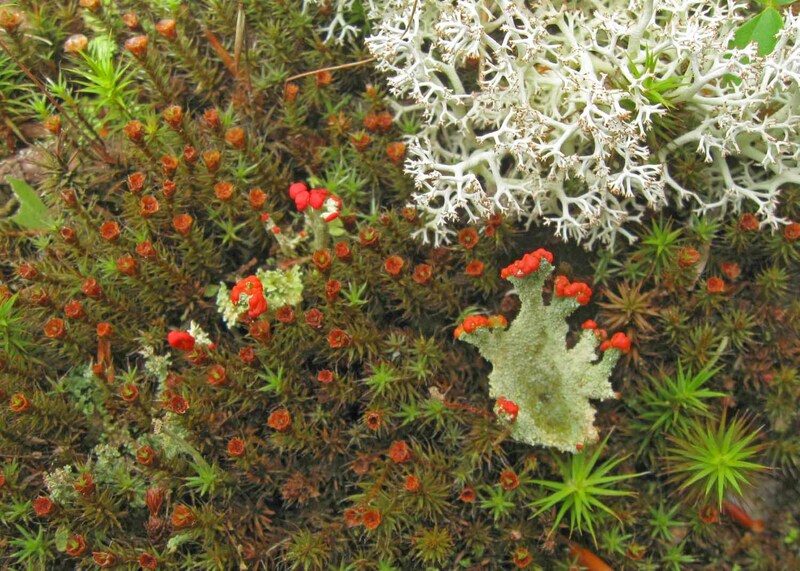 Hence the darker background and more green in the vegetated areas. In the meantime, I've uploaded an animation showing the results of the Infragram point and shoot taken in a park nearby after a decent rainstorm. I will go back to photograph the same spot once the ground has dried out to see if there are any big differences in the NDVI. with this camera can I see how deep is ice? I think any camera could allow you to estimate how thick ice is, if you can put the ice between the camera and the light source. The thicker the ice, the more light will be absorbed and the dimmer the light source will appear on the other side. Near infrared light behaves similarly to red light when passing through ice -- both are mostly absorbed by the ice, but NIR is absorbed more strongly. Very interesting post. 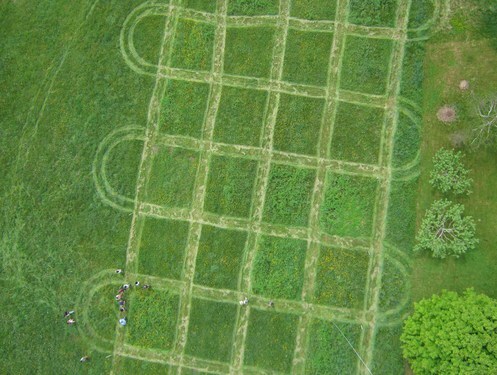 How can one take this a step further and analyze the % green areas that correspond to greenery? For example, the output would be to get the square footage of area that is cultivated or green. This should be copied to the C:\Program Files (x86)\Fiji\Fiji.app\luts directory or something like that on Windows, and I guess to .../Applications/Fiji.app/luts on Mac. 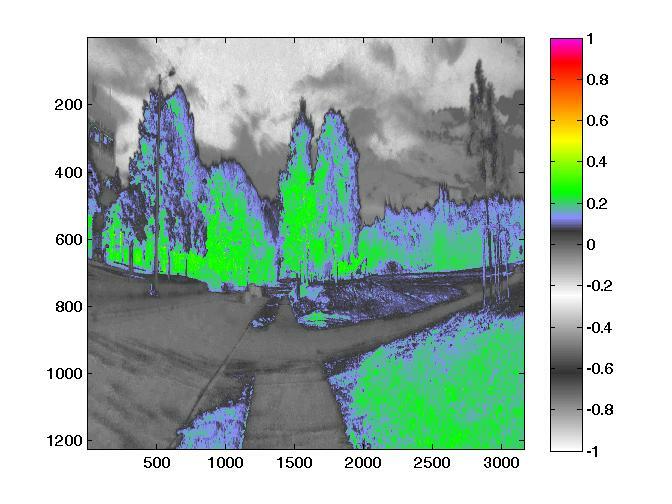 how to calculate the chlorophyll content in terms of NDVI? Hi jtuhtan. You can get a MATLAB script? Thanks! Id like to use the alternating white/black/white/cyan/green/yellow/red/magenta gradient, Im using GIMP 2, and Im wondering how to do it? Ive just joined this forum, and found it really useful. Ive also got 2 mobius cams, one infrablue, the other RGB. Id like more useful color data, i just dont know how to do it. can you help? To do this in GIMP you will need to work with indexed images and upload a GIMP palette file (.gpl) which follows the Fastie colormap. My advice would be up upload Chris' NDVI_VGYRM.lut file and then using a text editor, compare it to the .gpl file to see how you can convert the files from one format to another. Once you have loaded the new .gpl then you can try it on your mobius imagery. Thank you for a quick response jtuhtan. I have the NDVI_VGYRM.lut, but have know idea how to use a .gpl file. Ive seen this: https://www.youtube.com/watch?v=-nNnWEHNO_w Im trying to get this done for a class in the next 2 weeks. This remote sensing just has so much potential. you can find my posts here: http://publiclab.org/notes/PatrickC/11-13-2014/binocular-mobius-tripod-for-nvdi any help is appreaciated. I still cant get the .lux file to work, and i need to get this working for class. is there a explanation to use the .gpl type files? The code I used was MATLAB, overlaying an image of the Fastie colormap onto the NDVI image. What software are you working with? I use Fiji with the photomonitoring plugin...I would like to create a legend with the values, what would be AWSOME is to have the values on the image as well, not sure if this is possible. To be honest I'm new to all this and I'm not real sure what the difference in Fastie, stretched and normal processing do. I currently have a drone with a NDVI-7, an NDVI lens created by IR pro, camera on it. Hey jtuhtan ! I'm trying to create a colormap like yours in matlab, but cannot figure it out how to change half of the color range (from -1 to 0) in gray and the rest in RGB. Is it possible to share your matlab script? It will help my visualize better my NDVI image. Thank you in advance! Keep up with the great work! It's a good post, you have good photos. I'm new in photo monitoring. I have a question which camera do you use to take this imagens and in wich format (.jpg, .png, ....)? You only use Wratten 25A filter? A few different cameras were used to take those photos. Most of the cameras were Canon PowerShots. I think all of the photos were saved by the camera as jpegs. Some of the NDVI images were made from photos taken with a camera modified with a Wratten 25 filter. Some were made with a two camera system (see text).